Providing operators with the world’s biggest lottery jackpots. Lottery is a $300 billion worldwide industry, bigger than sports betting and igaming put together. Unlock the potential of this exciting vertical with our zero risk, simple to integrate solution. 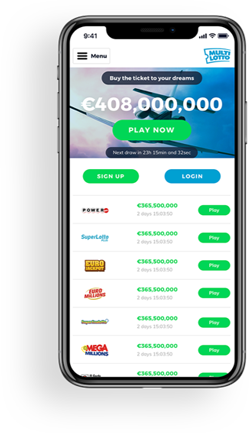 Thanks to LottoWarehouse operators can add the world’s biggest lottery jackpots to their platform, with all higher-tier payouts guaranteed by a jackpot coverage model. Jackpots available include America’s record-breaking Powerball and Mega Milliions, Europe’s EuroMillions and EuroJackpot and several more. Players benefit from an exciting new vertical and the chance to win hundreds of millions. Operators gain an exciting, zero risk new product capable of generating huge revenues. LottoWarehouse are licensed by the MGA and the UK Gambling Commission and power several major websites, including Multilotto. We are licensed by the gaming industry’s leading regulatory bodies, including the Malta Gaming Authority and the UK Gambling Commission. Please see our full license details below. Lotto Warehouse Ltd. is licensed and regulated by the Malta Gaming Authority (MGA), holding license number MGA/B2B/351/2016 issues on the 01/08/2018. Lotto Warehouse Ltd is licensed by the Gambling Commission in the United Kingdom under license number 000-047713-R-326100-001 issued on the 19/04/2017. We currently offer 15 different lottery betting products, however we'll be adding even more big jackpots to our portfolio in the near future. We've got the four biggest lottery jackpots in the world, comprising Powerball and Mega Millions from the United States and EuroMillions and EuroJackpot from Europe! Here are a few facts about our big four. Powerball created the world's biggest ever lottery jackpot – a massive $1.6 BILLION in January 2016. Mega Millions is the world's second biggest lottery and has created several jackpots in excess of half a billion, with the biggest a $656 MILLION IN 2012. EuroMillions is Europe's biggest lottery and is played in nine countries including the UK, France, Switzerland, Spain and Ireland. EuroJackpot is Europe's second biggest lottery and is played in 18 countries including Germany, Sweden, Denmark and Norway. Cash4Life is the huge New York lottery that offers a top prize of €1,000 a day for life. Second prize is €1,000 a week for life! Lotto Warehouse HQ is based in the international gaming hub of Malta in one of the island's most sought after office spaces. If your operation is also Malta based, feel free to drop by for a chat. Lottery Betting is placing bets on the outcome of lottery draws in order to win the same prizes, including the jackpot. The customer experience is very similar to actually entering the lottery. The player chooses the draw, they pick their numbers in the same way and they will win all the same prizes as they would had they entered the official draw. All highter tier payouts are then guaranteed by Lotto Warehouse’s jackpot coverage model. We are licensed by the Malta Gaming Authority and the UK Gambling Commission. For full details on all our licenses please see ‘Licenses’ within our ‘About Us’ section. How quickly can this be integrated? Our simple API integrations takes no time at all – your tech team will love us! The customer journey stays exactly the same as is standard for your platform and you can use existing payment providers. The look and feel of the product will reflect that of your site. Also, our solution brings management and monitoring together, ensuring efficiency and minimal demand on internal resource. How are you able to cover jackpot payouts? You advertise the jackpot and we'll take care of paying it out! All higher-tier payouts are covered by an innovative jackpot coverage model. Every aspect of our offering has to adhere to the rigorous standards of both the UK and Maltese licensing authorities, including our ability to guarantee operators full protection against large payouts. How many lotteries do you offer? We offer 30 lotteries in total, but we'll be adding more in the future too. Here’s the full list. Lotto Warehouse Ltd. is a company incorporated in Malta with company registration number C77100 having its registered address at 1st Floor, Suite 3, Central Business Centre, Mdina Road, Zebbug ZBG9015 MALTA. Lotto Warehouse Ltd. is licensed and regulated by the Malta Gaming Authority (MGA), holding license number MGA/B2B/351/2016, issued on the 01/08/2018 and the Gambling Commission in United Kingdom under licence number 000-047713-R-326100-001 issued on the 19/04/2017.